We love Black Stone Cherry at PRS. And Chris from Black Stone Cherry loves PRS. The frontman’s been rocking PRS guitars for a good while – and now he’s got his own SE signature model, available exclusively in Europe! The Singlecut-style SE Chris Robertson has a mahogany body and neck, bevelled maple top with flame veneer. The 24.5” scale length, 22-fret neck sports PRS’s Wide Fat profile for a great vintage feel – and the onboard electrics also reflect Chris’s obsession with old-school tone. A US PRS 57/08 humbucker in the bridge position is partnered with an SE Soapbar pickup at the neck – harnessed to a simple three-position toggle switch and volume/tone for each pickup – to allow access to a wide range of distinctive and characterful rock’n’roll voices. And the guitar’s stripped-for-action vibe is reflected in the rock-solid but highly adjustable PRS stoptail bridge. 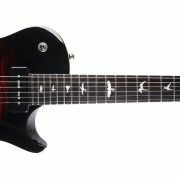 The PRS SE Chris Robertson Signature model comes in a single colour choice – Black Stone Cherry Burst, of course!